Mary has always had a passion for animals, and she has been working in animal agriculture since 1984. She has a bachelor’s degree in Animal Science with an emphasis in livestock production management from Kansas State University. Most of her work has been in the horse, beef and dairy industry until she got into the goat industry in 2012 and has focus primarily on producing meat goats. She started training horses at the young age of twelve, has raised American Quarter Horses since 1987 and has been a ‘Cowboy in the Girl Kind of Way’ since 1987, where she worked on various ranches, in feed yards and a dairy. Mary has been accused of collecting animals over the years. Her current ‘collection’ includes six horses, a BLM donkey, three Border Collies and at last count, 115 goats. In her spare time, Mary enjoys reading and studying various subjects, such as biology, chemistry, astronomy, algebra, history and the Bible. 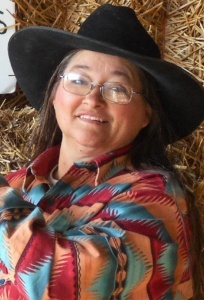 She also enjoys writing and is currently writing articles for the online news magazine called; Front Porch Newspaper, working on a book of her misadventures as a cowboy and a book about goats. Mary is also known as the Barnyard Mare, Duchess of the Prairie and is a storyteller and public speaker. She tells her stories about her misadventures as a “Cowboy in the Girl Kind of Way” and she also speaks about raising goats, grazing goats and the goat industry as a whole. If you would like to book her for a speaking engagement, please contact her for scheduling.